Our hops are tested at the Virginia Tech Hops Testing Lab at least twice a season to ensure that the alpha acids have reached the expected value for Cascade Hops, and to provide brewers with data they need to develop great wet hop ales. 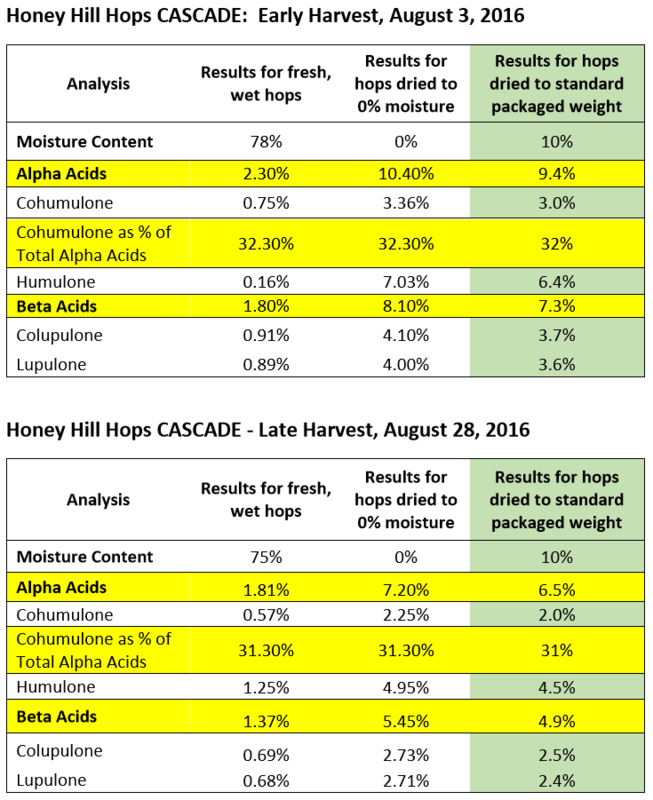 VA Tech reports results for both wet hops (as received) and the hops dried to 0% moisture. They provide a simple formula for converting these results to percentages for hops dried to 10% moisture content (last column), the standard for dried packaged whole leaf or pelletized hops. Alpha percentages for dried Cascade hops are typically in the 4.5% to 6.5% range, although percentages can vary markedly across years due to variable weather, soil, and harvest conditions. Our Cascade hops showed a higher than average percentage of alpha - testing at 9.4% alpha for the earliest harvest and 6.5% alpha late in the season. The formula to convert alpha acid and beta acid concentrations for wet hops to concentrations for hops dried to 10% moisture content is: Tested acid value x [90/(100-tested percent moisture)]. Since hops are generally harvested when the moisture content is between 75% and 78%, you should only need to multiply the dried hop weights in your recipe by 3.5 to 4 to get the wet hop bittering effect equivalent (assuming roughly equal alpha percentages). If the wet hops have been in the sun for a few hours or in a warm room for a day or two, more moisture will have evaporated, so the conversion factor may be closer to 3 than 4. If the alpha acid percentages for your wet hops and typical dry hops are about equal, multiply the dry weight in the recipe by the appropriate conversion factor to see how many ounces of wet hops you need. When hops are harvested they are very moist. In fact, about 75% of their weight is water, hence the term “wet hops” for hops fresh from the bine. However, before hops can be packaged or pelletized, they have to be dried down to between 8% and 12% moisture content. Hops with a moisture content above 12% are likely to mildew and oxidize, while hopes dried below 8% lose essential oils and tend to shatter during packaging and processing, resulting in the loss of lupulin as well. The alpha acid percentages brewers are used to seeing (i.e., those reported on the packages of hops pellets or dried whole leaf hops you buy) are based on the dried hops values, not the values when the hops were first harvested. Alpha percentages for wet hops are much lower, but as shown in the Alpha Acids table, there is a simple formula for converting wet hops percentages to percentages based on the more familiar 10% Moisture Content (MC) samples. If the alpha acid % for the wet hops (based on 10%MC) is similar to the alpha % of the hops your recipe calls for, you can use the table below to determine how to convert dried hop weights to wet hop weights. As the table illustrates, the moisture content of the wet hops is the primary determinant of the conversion factor. If you google this question, you’ll find some websites saying that in order to get the same bittering effect you need 5 to 6 times more wet hops than dry hops. This is seldom the case, however, unless you're getting very early less mature harvests. If the alpha percentages are different, convert your hops amounts to Alpha Acid Units (AAU) first. An AAU is just the Alpha Acid % multiplied by the weight in ounces. For example, 1.5 ounces of Cascade hops with 5% alpha acids gives you 7.5 AAUs. If the alpha acid percentage in the next batch you buy is 7.5%, you will only need 1 ounce instead of 1.5 ounces to get the same bitterness (boiling times and all else being equal). If you buy wet hops and are lucky enough to have a grower who provides the actual alpha percentages for the wet hops (which will be much lower than for dried hops because of the all the moisture in the hops) AAUs make the dried hop to wet hop conversion very easy. You simply divide the AAUs you need by the actual wet hop alpha percentage to determine how many ounces of wet hops you’ll need. For example, our 2016 mid-harvest alpha percentage was around 2% for the freshly picked hops, so if a recipe called for 10 AAUs, you would divide 10 by 2 to determine that you need to use 5 ounces of wet hops in that recipe.